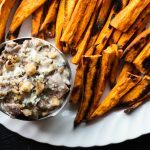 Baked sweet potato fries are a celebrated pleasure of mine, and few things kick it up the way bacon walnut blue cheese dip does! 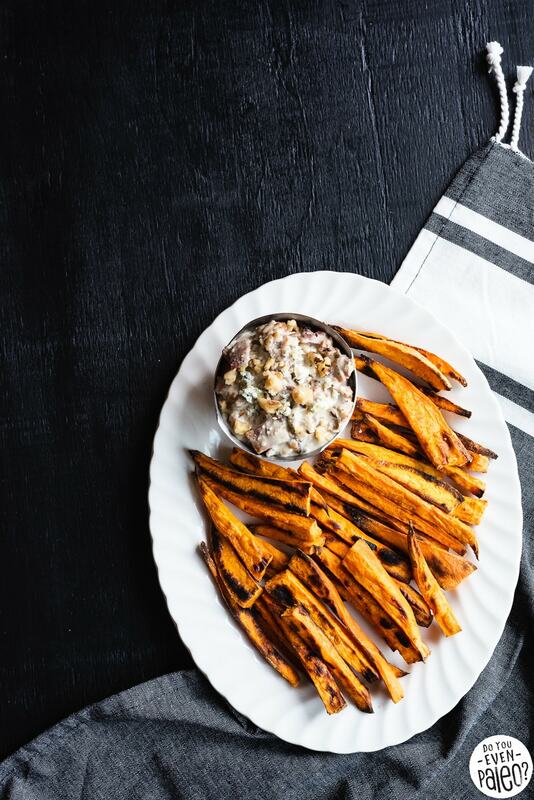 I spent a crazy long time trying to figure out how to make the best bakes sweet potato fries at home. I finally settled on a baked sweet fries recipe that I’m proud to share—crisped with the help of potato starch or arrowroot powder and generous glugs of extra virgin olive oil. Plus, the bacon walnut blue cheese dip. Salty with strong flavor, it can be used for way more than sweet potato fries. 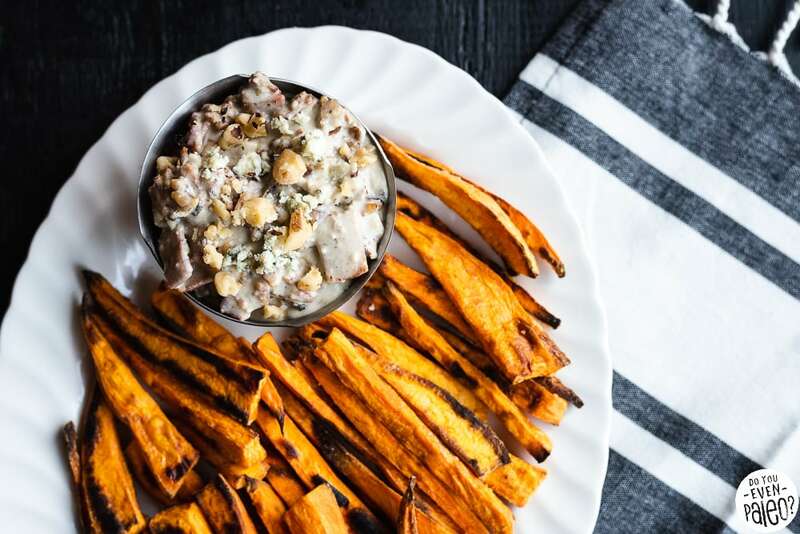 A local restaurant in Fargo serves sweet potato fries with bacon walnut blue cheese dip (bonus points if you know which one! ), and from the first time I ordered it, I wanted to recreate it at home. Three years later, and I finally got around to testing and honing this recipe! This is one of those rare recipes on DYEP that’s not paleo because of the blue cheese. Forgive me. Even though I’ve tried kicking dairy to the curb lately, I have to make occasional exceptions! After all, life’s meant to be lived right? And I don’t think it’s any secret that I’m not 100% paleo all the dang time. 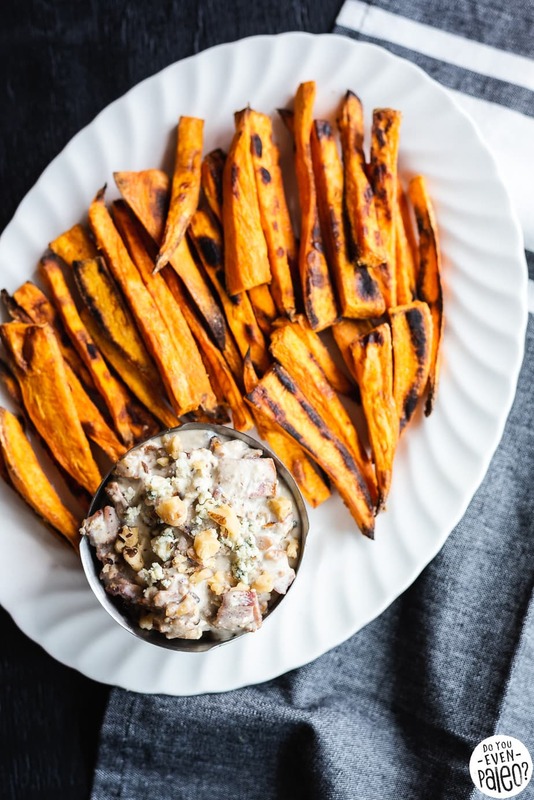 I’ve truly got a thing for sweet potato fries – I’ll eat them no matter how floppy, salty, burnt, or crispy they are. Sweet potato fries are just good. However, my voracious appetite for any ol’ sweet fries just doesn’t cut it for the blog. I only post recipes that I’m confident in… Food that I would gladly serve my friends and family. Sad, floppy sweet potato fries just won’t cut it. I’m going to be honest. I’ve tried damn near every method of baking sweet potato fries, and I’m just convinced that they will never be as good as fried sweet potato fries. That said, these come close. One of the secrets to good baked sweet potato fries is that you’ve got to eat them hot. Let those fries sit for too long, and they’ll get soggy no matter what. Next tip? Space ’em out. You’ll probably have to do at LEAST two batches in the oven. 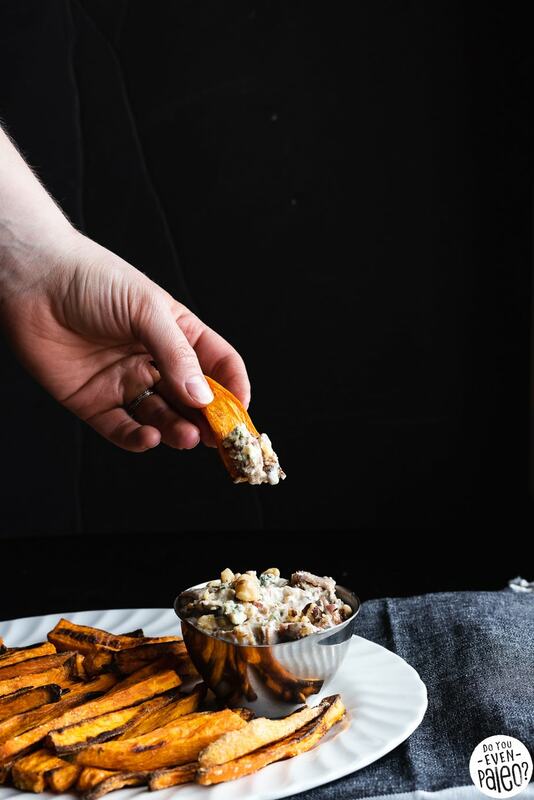 You’ll probably have some leftover bacon walnut blue cheese dip, so I’ve got a great suggestion for you. It’s almost grilling season. BURGERS. My mouth is watering just imagining how awesome this dip would be slathered all over a freshly-grilled burger. I mean, there’s a good chance I should have just made that recipe instead, but I do like my sweet potato fries all right. My other suggestion would be eating this salty, savory condiment with a spoon. But that’s not exactly a well-rounded meal. 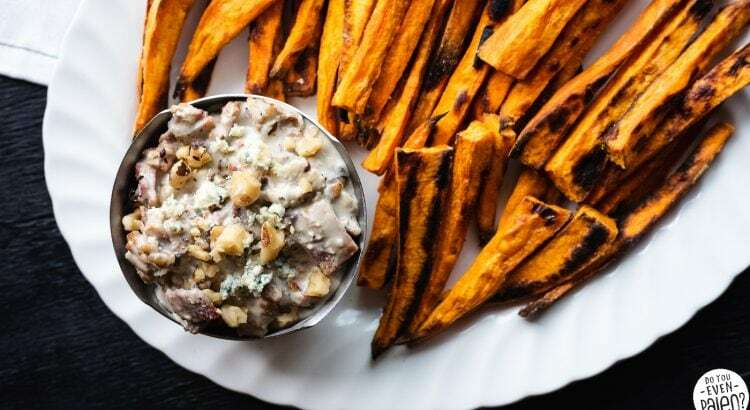 So bake up some sweet fries and whip up a quick batch of bacon walnut blue cheese dip. And dip, dip, dip away! Preheat oven to 375 degrees F. Line a baking sheet with parchment paper and lay bacon flat on the lined baking sheet. Cook for 10 minutes or until crispy, but not burned. Remove from the oven and let cool. Spread the walnuts out on a separate baking sheet and toast in the oven for 7-8 minutes. Remove and set aside to cool. Increase the oven to 400 degrees F. Peel sweet potatoes and cut into uniform 1/4 inch sticks. Toss the sweet potato sticks in large bowl with arrowroot powder and 1/4 teaspoon salt. Add the olive oil and toss until coated. Line a baking sheet with parchment paper. Spread the sweet potato fries on the baking sheet, spacing them at least an inch apart. You may have to roast in two batches to space them properly! Roast the fries for 15 minutes. Remove from the oven, flip, and roast for an additional 10 minutes. Sprinkle the fries with remaining 1/4 teaspoon sea salt once you remove them from the oven (optional – I like my fries salty). 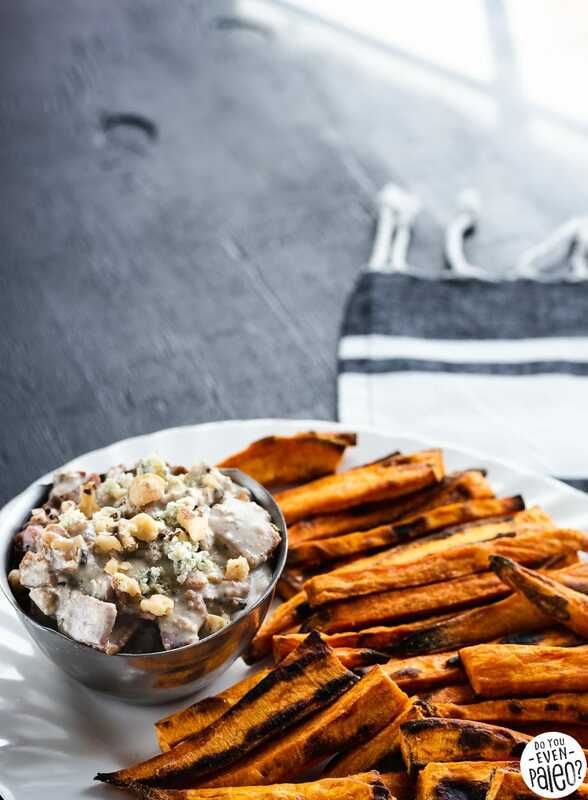 While the sweet potato fries cook, prepare the dip. Add 1/4 cup blue cheese, coconut milk, salt, and pepper to a jar or narrow container. Use an immersion blender to blend until relatively smooth. If you don’t have an immersion blender, you can use a small blender or skip this step entirely. Stir in the remaining blue cheese and toasted walnuts. Crumble the cooked bacon and mix into the dip. Refrigerate until sweet potato fries are ready. I prefer potato starch for truly awesome baked sweet potato fries, but arrowroot flour makes a decent backup. Don't subscribe All Replies to my comments Notify me of followup comments via e-mail. 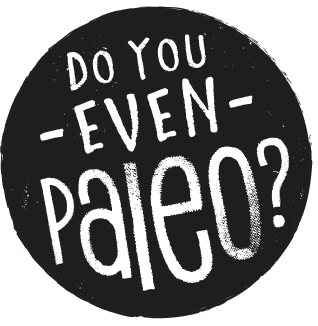 You can also <a href='https://www.doyouevenpaleo.net/comment-subscriptions/?srp=4001&srk=87505361eee98908ddf6ccb8681f50d6&sra=s&srsrc=f'>subscribe</a> without commenting. 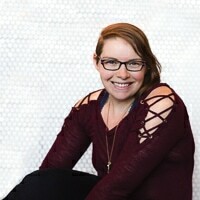 Tacos Every Damn Day: The E-Book Is Finally Here!